Whether you work in a company with 10 employees or 10,000, there’s a good chance you have structures used for the bulk storage of grain, coal, or wood chips, commonly referred to as silos. For more than one thousand years, silos have been an effective method of containing and protecting valued materials. Silos are good at keeping things in and not letting things out. Unfortunately, if you’re not a farmer or coal miner, silos are not helping your company. They are keeping people and their insights separate from one another. There are three ways to span the silos that are holding your organization back from much greater success: Strategy conversations, strategic capabilities and the StrategyPrint. 1. Strategy conversations. Consider how much time you and your team spends throughout the year discussing operational, budgeting and tactical issues. Now consider how much time your team spends discussing strategy. Is it 10:1, 20:1, or how about lots:zero? Research out of Harvard Business School confirms that 85 percent of leadership teams spend less than one hour a month discussing strategy and 50 percent spend no time at all. This inattention to strategy will have devastating consequences. A ten-year study of 103 companies by PWC showed that 81 percent of business failures were caused by bad strategy. Yet, for most companies strategy is nothing more than an annual event culminating in a dog-and-pony show that gets no further attention for the next 11 months. As I’ve helped companies of all sizes transform strategy from an annual event into an ongoing dialogue about their key business issues, I’ve noted several traits of effective strategy conversations. First, they require dedicated time on the calendar. If you don’t schedule time with your group and other functional groups, the conversations are simply not going to happen–everyone is too busy. Second, effective conversations strike the appropriate balance of having a guiding framework so that they’re productive, while at the same time allowing for the open surfacing of new ideas. And third, they happen at all levels. Strategic insights are not the exclusive domain of a few senior leaders. Provide a forum for all levels of people to discuss the business. 2. Strategic capabilities. A new study of 1,500 executives by YSC showed that only 23 percent of executives in the U.S. are strong at strategic thinking. Why so low? If you only play golf or the guitar once a year, are you going to play well? Probably not. If you only think strategically once a year during the strategic planning process, you’re not going to be strategic. What does this mean for you as an individual leader? Research with 60,000 executives in 140+ countries showed that “a strategic approach to leadership was, on average, 10 times more important to the perception of effectiveness than all other leadership behaviors.” In other words, if you’re not thinking strategically on a regular basis and others don’t perceive you to be strategic, your chances of gaining greater roles responsibilities and is nil. Without strategic capabilities, you’ll lack the knowledge, tools and skills to lead strategy conversations and set direction for the business. I’ve found that using a hybrid approach to developing strategic thinking capabilities consisting of live quarterly workshops, monthly strategy tune-up sessions, video-based training reinforcement and pulsed virtual content (white papers, MP3s, instructional videos) is an effective menu of options for improving both mindset and behavior. Another important component is providing managers with physical reminders in their environment to generate, capture and share their strategic insights. This can be accomplished with a mobile app such as the Strategy Vault or a basic notebook. The fact that 43 percent of managers cannot state their own strategy means that your efforts to enhance your team’s strategic capabilities can lead to real competitive advantage. An effective tool I’ve developed to help leaders set and communicate their business direction is the StrategyPrint. The StrategyPrint is a two-page blueprint for the business. Page one captures the key insights of the business in four areas: market, customers, competitors and company. Page two is the action plan, identifying goals, objectives, strategies, tactics and metrics. By using one common and concise planning instrument, leaders are able to efficiently communicate their strategies to others around the organization so that everyone is on the proverbial “same page.” The StrategyPrint also helps leaders align their strategies with others, by first finding common ground on the goals and then cascading that information throughout the different levels of the company. The result is a simple tool that spans the silos and ensures collaboration of thought and action. Silos are for corn and coal, not strategy. I facilitated one strategy conversation that led to an insight that generated a $100 million product three years later. It happened because people made the time to get together, had a professional framework to guide the discussion and were open to new ideas. $100 million can buy you a whole lot of corn and some coal to boot, if you’re willing to tear down the silos. Rich is the founder and CEO of the Strategic Thinking Institute, and has helped more than 50,000 managers around the world to develop their strategic thinking capabilities. A former Chief Strategy Officer and professor of strategy, he brings both real-world experience and practical expertise to help groups build their strategy skills. Rich is a New York Times, Wall Street Journal and USA Today best-selling author on strategy and has appeared on ABC, NBC and FOX TV. 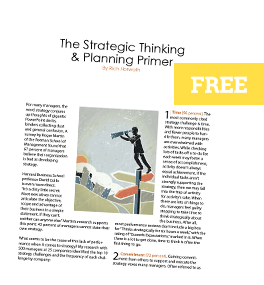 Sign-up to receive your free copy of Strategic Thinker and read the Strategy Espresso blog by visiting www.strategyskills.com.